The DEXs reviewed previously all resemble traditional stock market platforms, where traders can place orders and trade. 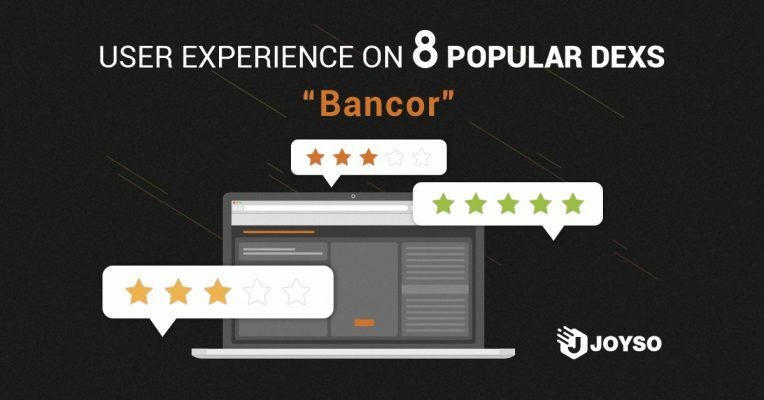 Different from the type of exchanges mentioned before, which you can place order freely, users cannot place orders on Bancor, instead, they only accept the price offered by the exchange, like how our bank’s currency exchange works. After the user inserts the amount of tokens he/she wants to exchange, the system gives the user an estimated price. 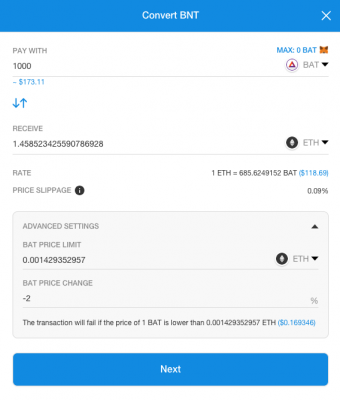 For example, as per image below shows, if you convert BAT to ETH, the estimated price given is 1 BAT to 0.0014603 ETH. If you key in 1,000 BAT instead, the quotation worsens to 1 BAT to 0.0014585 ETH. Like buying tokens in other exchanges, due to the lack of depth, the bigger amount you buy, the higher the price per unit. While trading on Bancor, you might find the estimated price offered on the interface decent, sometimes even better than other exchanges. However, it may not be what it seems. After I completed my first trade on Bancor, I found out the actual amount of tokens I received was different from what was shown on the website. 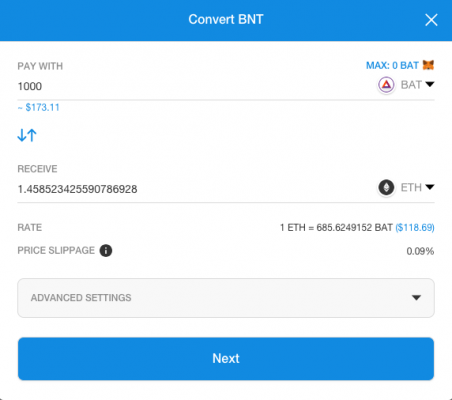 Take the quotation for example, I supposed to receive 1.45852 ETH for selling 1,000 BAT, but in fact I only had 1.4439348 ETH transferred to my account, which was lesser than expected. I realized, that the quotation shown was in the best case scenario. Detailed conditions could only be seen if you opened ADVANCED SETTING. As shown above, if you check advanced settings, you can see there might be a 2% price difference between final and estimated price. So the price you pay varies between 0.0014293 and 0.0014585. Although it’s possible to adjust the accepted price difference, the chance of your deal to success is lower if you adjust the price change close to zero percent. Unlike other exchanges which only have several mainstream coins/tokens as base, requiring two conversions, Bancor has a special feature. That is, user can set any preferred trading pairs as long as the token is listed. The trading interface on Bancor is intuitive. However, for someone who wants to get a better price, it is only suitable for small amount trading, since the price worsens as the amount of tokens grows. Bancor consumes relatively more in terms of gas. The minimum gas used in single transaction is at least 200,000 gas (unit), if the gas price is 11 GWEI then, user has to pay 0.003 ETH merely for gas fee. Bancor is fitting for small amount trading, but it might not be as cost-efficient due to the high gas fee.